A couple of cards I made on Create and Craft this afternoon. 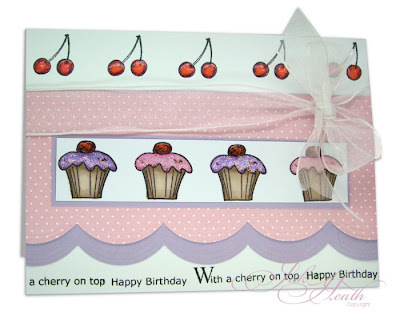 The first card below was made from the extra embellishment stamps from the Flippin' Scales stamp sets, coloured with Promarkers then the icing was glittered with Stickles glitter glue and the Cherries has Glossy Accents added to them to give them the shine. This one is the Flippin' Bathtime Stamp it was shaded with the ink it was stamped with and a water brush. Dont forget to pop over to the other girls Blogs on the Design Team. Great cards Jak enjoyed your show and gained some tips for stamping. Fantastic show yesterday Jak and i was giggling along with you and Steph. Love the cards you made on the show.